Ever wonder how your favorite birds and animals survive extreme winter weather? Naturalist Ariel sheds some light on their survival skills. It is hard to believe that we are experiencing winter days here in Wisconsin that are 50 degrees Fahrenheit below zero with windchill. As we are hiding away in the Welcome Center here at Upham Woods, there are many animals and plants struggling to survive right outside our heated buildings. These tough creatures have three different options for adapting to frigid winter changes when it comes to survival, such as migration, dormancy, or tolerance. In the fall, it is common to see a great blue heron stalking fish on the banks of the Wisconsin River here at Upham Woods, but now this large, gray/blue water-loving bird is on vacation. During these frigid temperatures, the river will freeze over, which means the herons must make a long journey south to find warmer temperatures. Many of the great blue herons that populate the WI River in the warmer months will fly to Florida or even as far as the Caribbean. This animal has adapted to this long flight twice a year with a wingspan of 6 feet and very powerful breast muscles. Also, since this heron will travel to popular paradise locations in the winter, it has adapted to tolerating both salt and fresh water habitats. There are many living beings surrounding us that cannot migrate from Wisconsin, because their roots hold them to the frozen ground. The only way that trees can survive the harsh winters here is something referred to as dormancy. Dormancy is like hibernation in that the trees’ metabolism, growth, and energy usage will slow so they can conserve energy. The first step for deciduous trees is the loss of their leaves in the fall. Abscisic acid (ABA) is a chemical produced after a leaf falls off the branch. In both deciduous and coniferous trees, ABA will be produced to signal the suspension of growth which prevents the tree’s cells from dividing. Because of ABA, trees do not grow during the winter. Trees will also transfer their sugars and nutrients to their roots for storage. Trees have adapted to go through this dormant stage each winter; therefore, it is a part of their natural phenological rhythm. When spring arrives, they will “wake up” and start growing and producing buds, leaves, flowers, and fruits once again. It is amazing that while I walk (bundled in layers) to and from the heated buildings here at Upham Woods, I see small, canine prints in the snow on my way. These tenacious critters such as red fox have been able to tolerate these less-than-desirable conditions with a few special adaptations. 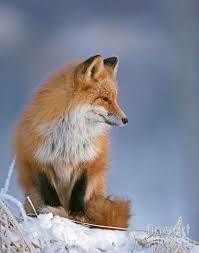 The red fox is an opportunistic eater, especially in the winter. Its huge, satellite ears can hear a mouse creeping under the snow and when the moment arrives, it will pounce snout first to grab its prey. Mice and rabbits are the main items on this animals’ winter menu. Fox, as well as other canines will grow stiff, bristly hairs around their toes for extra insulation and traction as well as special blood vessels in their toe pads to keep their feet above freezing. Also, these animals have a fluffy undercoat of fur that act as excellent insulation, while their coarse overcoat repels moisture. Fox are well-known for wrapping their bushy tail around their feet and nose while they sleep. This is a great way to retain the warmth of their breath as they exhale. Fox are early breeders and will mate in mid-January. They will find old badger or woodchuck burrows to rear their young or stay warm in. It is fascinating what animals and plants will do to survive the harsh winters here in Wisconsin. The range of adaptations allows all the living beings of the Earth to live simultaneously while filling different niches. It just so happens that my winter niche in Wisconsin is near a fireplace with a fresh mug of hot chocolate.